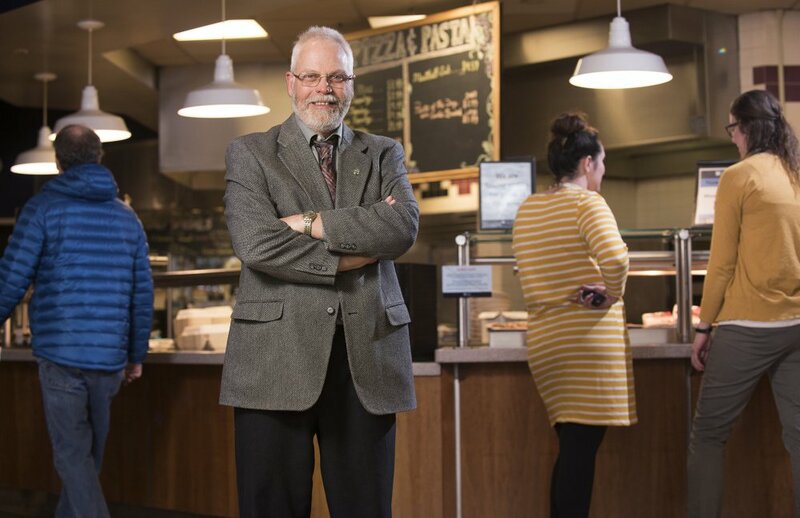 The director of dining services at the Univerity of Maine in Orono is both feeding the next generation and educating it about local foods. EDITOR’S NOTE: We designed our Scion Award for a young person or group of young people who are passionate about sustainability and on the road to becoming eventual leaders on such issues. But this year, none of the nominations we received fit that description precisely. After much discussion among the judges, we changed course and instead awarded a full-grown man who is doing extraordinary work to feed the next generation of Mainers and to teach them about local food, one delicious bite at a time. It all began with a load of local carrots. Stewart Smith – a vegetable farmer, former Maine commissioner of agriculture and University of Maine resource economics professor emeritus – approached Glenn Taylor, director of dining services at the University of Maine, in Orono, to ask what it would take for the school to buy carrots from Maine farms. Taylor was used to contracting with large distributors and had no idea if he could even consider buying local carrots. But the question got his wheels turning. Once he figured out he could, he started wondering how he could bring more local food of all sorts to campus, in season and in amounts large enough to satisfy college-sized appetites. “If Stew did anything for me, he taught me how to think like a farmer,” Taylor said. And he has managed to do all of this while still balancing the university’s food budget. Taylor, who is both feeding the next generation and educating them about local food, is the recipient of this year’s Scion Award. This year, for example, the school switched to significantly pricier all-local ground beef for its hamburgers. So he looked for savings elsewhere, seeking out a cheaper chicken tender the university could swap for the one it was then using. After a taste test, Taylor chose a brand that helped him shave a few pennies off each chicken tender, a total annual savings of $7,000 on just that one item. Taylor is now working on a plan to use local roast beef to fill the university deli meat order. The university goes through 7,000 to 8,000 pounds of roast beef a year. Central Maine Meats in Gardiner, which supplies it, is undergoing USDA scrutiny right now for its cooking process, Taylor said. “If they get that (approval), that will be huge,” he said. Despite his success with the chicken tenders, Taylor still struggles to supply the other parts of the chicken, and the school goes through a lot of chicken. “When you’re trying to compete nationally against these big chicken companies, it’s so hard to justify three to four times the cost per pound,” he said. Right now just 7 percent of the chicken served at the University of Maine Orono is local. Taylor hopes that as more schools, hospitals and other institutions in Maine make a commitment to serving local chicken, the price will drop. Sturrup said Taylor tries to get good deals for the school, but he also forges lasting relationships with vendors, farmers and the other people and organizations he works with, which Sturrup believes is just as important. Turns out that instead of all those football players grabbing six or seven milks at once, they returned to the dining hall later for more only if they were hungry. The strategy meant less food per meal, not more. Taylor says he is taking the money he has saved by reducing food waste and using it to buy more local foods. Next on Taylor’s wish list is a central food hub where institutions that are committed to buying local can pick up their local food in one spot, saving everybody time and money.